Professional marathoner Justin Lagat of the KenyanAthlete.com blog shares with us how he fuels his training, and Registered Dietitian Nutritionist Ander Wilson of Hot & Healthy Habits shares insights on how the Kenyan running diet helps fuel great running. As Kenyan athletes, we don’t just train hard. It also happens that our staple foods, which we’ve been eating since childhood, naturally help bring out the best out of our abilities. Even if you don’t live on the edge of the Rift Valley, you might find that these simple foods will help you elevate your running. Simple cooking: The process of preparing the food is often as natural as possible — boiling or pan frying. Green vegetables are at times just boiled in water and cream from the milk is added before serving. Food from farms, not factories: very few food items are bought from the shops, and when visiting shops we only buy a few items like cooking oil, sugar, and salt. The rest of our diet comes from local farms. 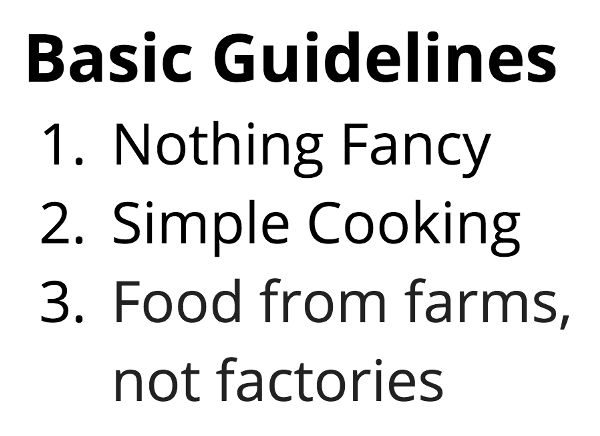 With these guidelines in mind, I’ll take you through what my daily meals look like. This diet looks to be ideal for a distance runner. It’s high in carbohydrates from Ugali, contains great protein sources between the milk, beans and eggs, and packs in the antioxidants that a runner needs with the green vegetables. When you walk around in Kenya and anyone asks you whether you have taken tea, they are actually asking you whether you have eaten breakfast. Tea is the main drink for breakfast, and especially among the Kenyan athletes it can serve as the largest portion of breakfast. Other drinks, like coffee and cocoa, are only consumed on rare occasions. Tea is made by pouring a handful of tea leaves into a sauce pan of boiling water, adding some milk in it and waiting for five minutes to continue boiling. Some people, but very few, prefer black tea which doesn’t contain any milk in it. The final product is tea that’s not too strong and often will contain as much as 50% milk or more. While tea is the most important staple of a runner’s breakfast, some sort of carbohydrate is an ever-present accompaniment. Most popular are chapati (a kind of pancakes made from wheat flour), mandazi (fried dough, also from wheat flour), sweet potatoes, bananas or bread. Fried or boiled eggs are also common during breakfast and are consumed three to four times in a week. 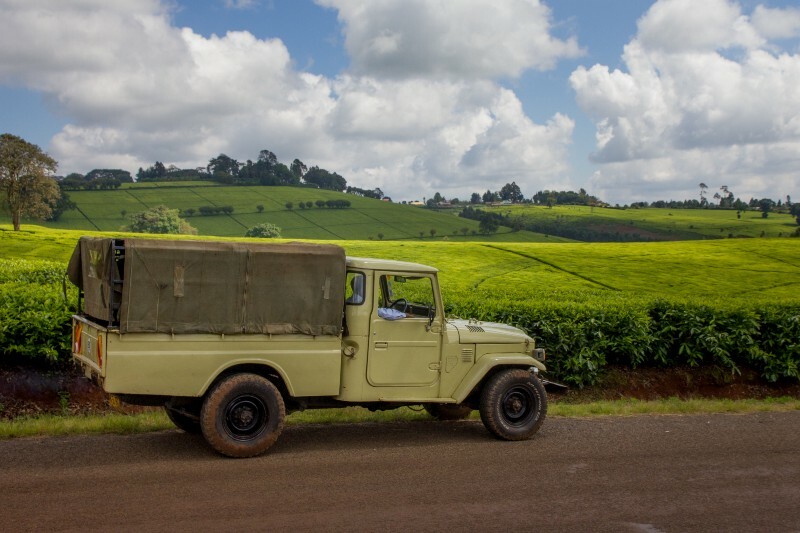 Kenya is the third largest producer of tea in the world, and tea plays a major role in the Kenyan diet. Take a mug of tea before going out for a heavy training in the morning, then come back and complete breakfast. When the longs get very long, we wake up very early in the morning, around 4 AM, to go out for the long runs so that we can finish before it gets too hot. In such days, I won’t have to eat anything before going out, but will take a heavy breakfast once I get back in the camp at around 9 AM. For those days when we are doing intensive mid-morning speed workouts, we eat breakfast very early, around 6 AM, so that when we go out to train at 9 AM, we won’t get upset stomachs or feel hungry. Eating between 400 and 800 kcal worth of foods, two to four hours before a run is ideal. However, it’s not always possible for early runs. When scheduled for early morning training, runners should consider eating a large and late supper the evening before, comprised of carbohydrate rich foods, a moderate amount of protein, and minimal fat. If supper time isn’t flexible, simply add in a snack before going to sleep for the night. 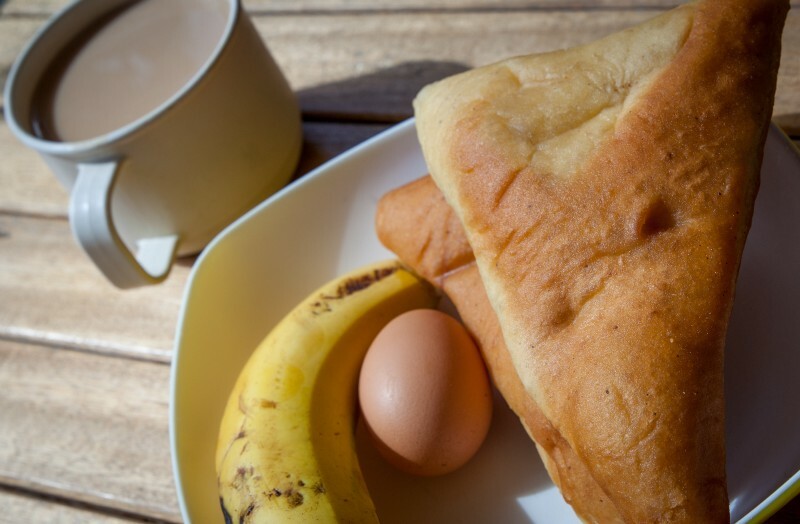 Breakfast after a long run: mandazi, banana, hard boilded egg, and milky tea. 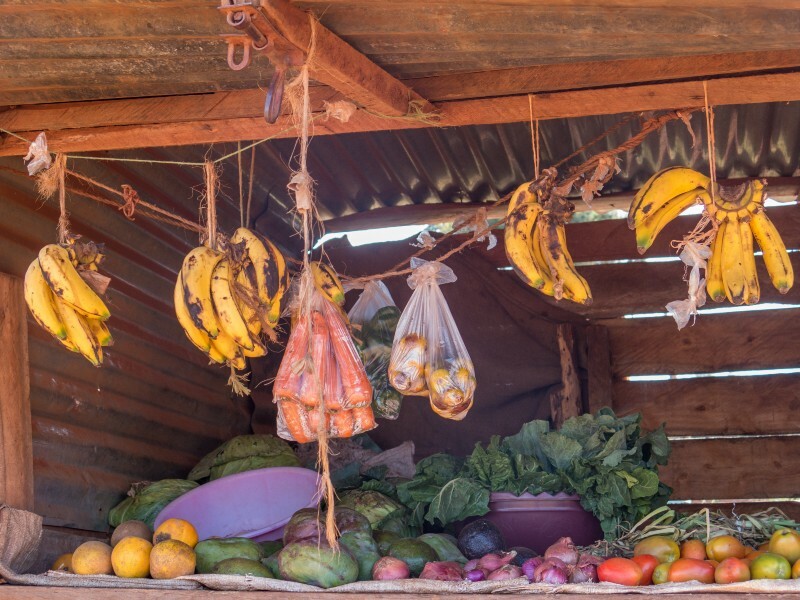 Rice, beans, potatoes, pasta, green grams (mung beans), and green vegetables like cabbages and sukuma-wiki (a type of colewort — the name literally means “push the week” since it is cheap, filling, and available year round) are the common foods for lunch in most Kenyan homes and athletic camps as well. Compared to what runners eat for supper, lighter foods are eaten at lunch so that runners can be able to go for their training again in the evenings. Sukuma-wiki and ugali for lunch. For lunch, carbohydrates usually take the largest portion of the plate, often 50–60%, with the rest being vegetables and beans. If you’re a distance runner who tracks macronutrients, your carbohydrate intake should be AT LEAST 55% of your total calories. The day before a long run or race, bump up carbohydrate intake to 65–70% of your total calories. If someone is eating fewer carbs than this, they will feel a huge increase in energy during their next run if they start eating the appropriate amount of carbohydrate. Beans and vegetables also add great carbohydrate content to this lunch. Runners should consume at least eight servings of fruits and vegetables each day.Fruits and vegetables are rich in antioxidants, which help the body fight off free radical damage caused by the extra intake of oxygen during distance running. When doing two afternoon workouts, runners will often have a second lunch. For this second lunch, a popular option is porridge made from millet flour, sometimes mixed with sorghum and soy beans. This is usually taken after the afternoon runs. This works well for post-run nutrition needs. After a long run or race, runners should eat between 100 to 400 kcal of food comprised mainly of carbohydrates and a moderate amount of protein. This snack or “second lunch” helps replenish glycogen stores (the storage form of carbohydrates, which is the body’s best and preferred source of fuel), which the runner will need for the next training session. 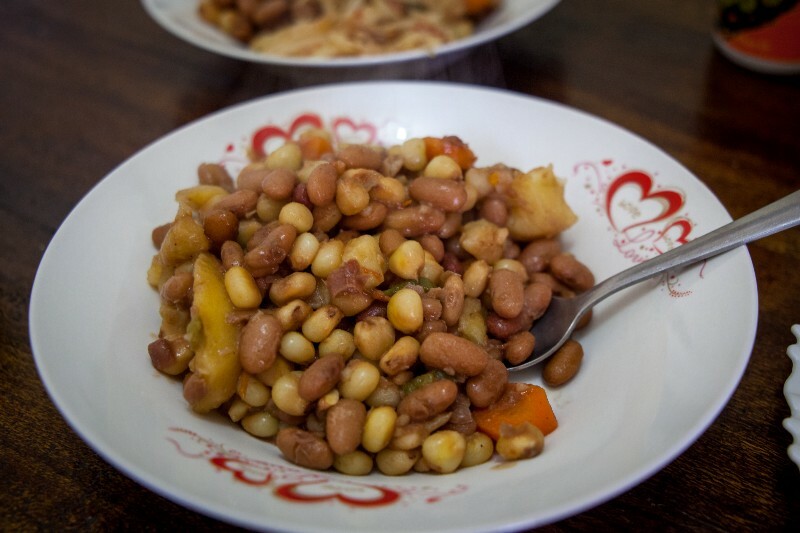 Lunch of githeri: maise with beans, carrots, and potatoes. This is where the famous ugali features. Other food items are often there to accompany the ugali. Ugali is made from coarse ground maize flour. First the maize is harvested, shelled to separate the grains from the cobs, dried, and then taken to the local mills to be milled into flour. The process of making ugali is simple, but it needs a lot of timing while doing it. Water is left to boil in a sauce pan. As soon as it boils, maize flour is added in small amounts as the cook keeps stirring to make sure that the liquid remains soft and that too much flour is not added at once which will cool the mixture and form undesirable hard texture. As the mixture thickens, a separate and relatively bigger stick is used to continue stirring and rolling over the mixture until it starts to harden. Then it is left simmer a little as more water evaporates and the ugali gets harder. The final product is a thick cakey paste that’s great for soaking up sauces. Green indigenous vegetables are very common during supper, and a glass of milk to wash down the meal. Mursik, which is a type of fermented milk, is also available most of the time and often takes the place of fresh milk. Mursik is also a special drink among Kenya’s Kalenjin community and is usually served to special visitors when they visit and in many other occasions as a celebratory drink. Fermented foods, such as mursik, are great sources of probiotics! Probiotics are living bacteria (the very good kind!) that help make up the intestinal (or gut) flora. A healthy intestinal flora is the foundation of good health, and yes, its health depends largely on the food you eat! Probiotics are found in cultured and fermented foods (kombucha, mursik, miso, yogurt, cottage cheese, kimchi, sourdough bread, buttermilk, sauerkraut, kefir, sour pickles, tempeh, maziwa lala, fermented porridge, osugha, susak). Probiotics are important to runners because they improve digestion and can help prevent GI distress. It’s important to note that exercise, while a very positive activity, is considered a stress on your body. Large amounts of stress (even from exercise) can GI distress. Probiotics, along with several other stress reducers (most notably SLEEP! But that’s a separate blog post), help repair this damage. 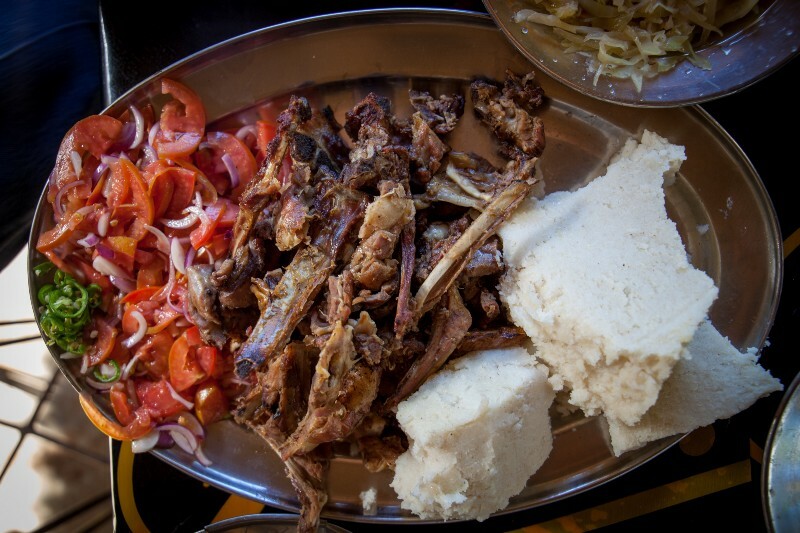 Meat, even though it is economically hard for most of the households in Kenya to afford, comes to the table once or twice every week during supper for runners. Beef is relatively cheaper and more available in the local butcheries than poultry and fish, and is prepared with plenty of sauce to accompany the ugali. I think this highlights a very important and often missed fact about sports nutrition — athletes do not need to consume large amounts of meat. In the diet outlined in this blog, protein is obtained from a variety of foods, including milk, eggs, beans, vegetables, and the occasional piece of meat. Runners should focus primarily on obtaining adequate amounts of carbohydrate, the body’s preferred source of fuel. A rare dose of meat: nyama choma (grilled goat) with ugali and kachumbari (a salad of tomatoes and red onions). Portions here are enough for 3–4 people. One of the things you will notice when you enter a training camp in Kenya, is athletes walking around will always carry small water bottles. The amount of training you do, and what you expect in the next workout, will certainly force you to drink as much water as possible. Most athletes take around three to five litters of water in a day. Roadside stands with fresh fruits and vegetables are common, and essential. Like water, fruits are also common among the athletes and are eaten whenever they are required any time of the day, or night. Common fruits are oranges, bananas, avocados, pineapples and mangoes — depending on what’s in season. Hydration is a balance of water, carbohydrates, and electrolytes. What’s brilliant about the focus on water and fruit is that the combination provides all three. No sports drinks required. Needs are met through real food. Ander’s final comment: In summary, this way of eating is ideal for a distance runner. Runners everywhere could benefit from modifying their diet to incorporate the eating habits listed here.